PARIS, Me. (WLS) -- An animal shelter in Maine is looking for a forever home for a purebred Staffordshire bull terrier who was brought in as a stray dog four years ago. Responsible Pet Care of Oxford Hills posted a picture of Ginger with a sign around her neck pleading for adoption. 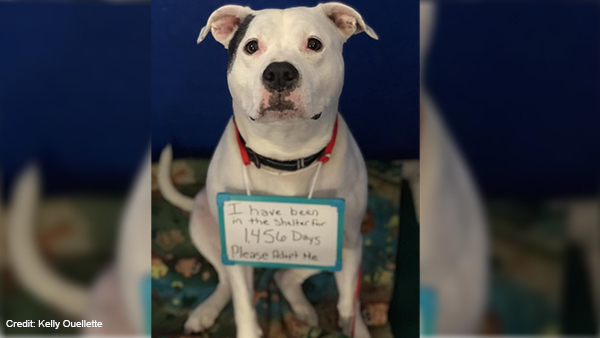 "I have been in the shelter for 1,456 days," the sign reads. "Please adopt me." In the Oct. 18 Facebook post, the shelter described Ginger as "an amazing dog," and said all the staff love her deeply, but she needs a home. They said she's a princess but "she does have some issues with resource guarding, so no small children." Her bio page says she is spayed, house-trained and up to date on shots, but is not good with other dogs, cats, or children. Ginger will not be adopted to a home with other pets or with children. In a follow up post on Oct. 23, the shelter said she's still up for adoption even as they're overwhelmed with applications. All potential adopters need to fill out an application and have their references checked. Shelter staff will perform home checks for any potential adopter, and potential adopters must meet Ginger before an adoption is approved. Click here to visit Responsible Pet Care of Oxford Hills and find more information.